How do you find the ApplicationPoolIdentity Account? 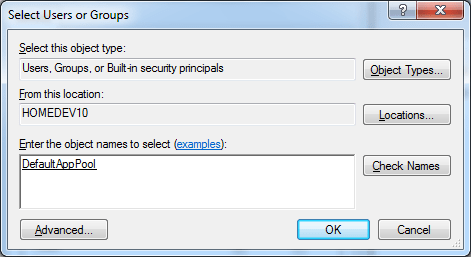 Under IIS 7 you have the ability to set the user account that the Application Pool will run under. By Default this appears to be a setting called “ApplicationPoolIdentity”. So if you need to provide access for this user to a local system resource how do you find the user account when you are searching in the security tab? When the application pool is created a new user account is created with the name of the Application Pool. I noticed the other day that on one of my servers image thumbnails were not showing. Click Start and Right-Click on “Computer” and choose “Properties”, (or if like me you like your “Computer” icon on your desktop then just Right-Click on the computer icon on your desktop). You should now be able to browse your images as thumbnails again. Sigh! Thanks for turning that off by default Microsoft! Long ago when versions of remote desktop changes the /console switch to login to the console of a server remotely stopped working, some time around the release of the OS that shall not be named by Microsoft. (Vista). Anyway, I just did some digging and found all these incorrect solutions, so here it is.